Welcome to Pine Tree Village Spa and Resorts, your own special village right on the edge of the Jim Corbett National Park. Pine Tree Village resort takes you into the heart of nature without compromising on your luxury and comfort. 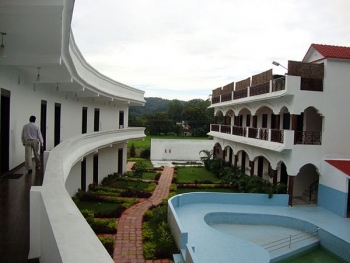 Pine Tree Village Spa & Resort is situated in Village Dhikuli on Ranikhet Road. The 12 mud cottages at the resort gives a village look and a unique experience. The resort is designed to create the feel and atmosphere of an actual village, Pine Tree Resort is a great destination if you love nature and Indian village to return to your rural roots. Pine Tree Village is the perfect destination for travellers seeking escape from hustle and bustle of the city for a weekend. Equipped with modern amenities Pine Tree Village Spa n Resort offers the guests with service par excellence. Pine Tree Resort is located in Village Dhikuli on National Highway No. 121 at the entrance to the Jim Corbett National Park. It is a short, 250 km drive from New Delhi through beautiful landscapes and green forests. Pine Tree Village Spa Resort serves the travellers with total 12 Luxury Mud Cottages and Luxury Huts. The idea of this separately made collection of ethnic mud cottages is to recreate the magic of village life and provide guests with peaceful accommodation in the lap of nature, away from the hustle bustle of cities. The cottages are equipped with king sized double bed, LCD television, attached bathroom with 24x7 running hot and cold water and Wi-Fi. - Fruit basket & Cookies in the room on first day. - Tea / Coffee Maker in the room. Ramnagar railway station is the nearest from the Pine Tree Village Resort. Dhikuli is 256-kms from Delhi, 145-kms from Lucknow and 9-kms from Ramnagar. The route from Delhi spans Hapur-Murababad-Ramnagar. The route from Lucknow spans Bareilly-Kichha-Rudrapur-Doraha-Kashipur. Ramnagar is served by frequent buses to and from Nainital and Ranikhet, 112-kms north. The nearest Airport is Pantnagar Airport, 50 Km away in the town of Pantnagar in Udham Singh Nagar district. However Indira Gandhi International Airport at Delhi is the closest international airport (300 km).